As you may know, we alternate the occasion of the BJUI Social Media Awards between the annual congresses of the American Urological Association (AUA) and of the European Association of Urology (EAU). Our first awards ceremony took place at the AUA in San Diego in 2013, followed by the EAU in Stockholm, and a really fun evening at AUA in New Orleans last year. This year, we descended on Munich, Germany to join the 13,000 or so other delegates attending the EAU Annual Meeting and to enjoy all the wonderful Bavarian hospitality on offer. More about that in our blog posts from #eau16. On therefore to the Awards. These took place on Sunday 13th March 2016 in the roof garden bar of the beautiful Bayerischer Hof hotel. Over 70 of the most prominent uro-twitterati from all over the world turned up to enjoy the hospitality of the BJUI and to hear who would be recognised in the 2016 BJUI Social Media Awards. Individuals and organisations were recognised across 46 categories including the top gong, The BJUI Social Media Award 2016; awarded to an individual, organization, innovation or initiative that has made an outstanding contribution to social media in urology in the preceding year. The 2013 Award was won by the outstanding Urology Match portal, followed in 2014 by Dr Stacy Loeb for her exceptional individual contributions, and in 2015 by the #UroJC twitter-based journal club. This year our Awards Committee consisted of members of the BJUI Editorial Board – Declan Murphy, Prokar Dasgupta, Matt Bultitude, Stacy Loeb, Mike Leveridge, and Henry Woo, as well as BJUI Managing Editor Scott Millar whose team in London drive the content across our social platforms. The Committee reviewed a huge range of materials and activity before reaching their final conclusions. As befits the fast-moving nature of social media, we decided to omit a couple of previous categories and add two new ones. 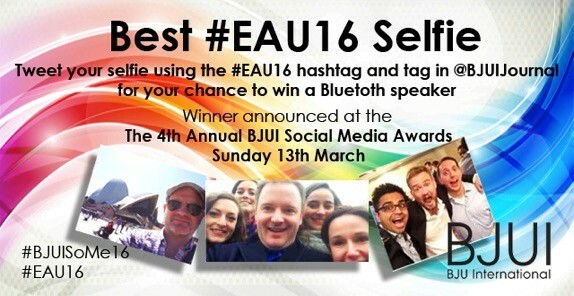 One of these was the “Best #EAU16 Selfie” competition which we launched on the eve of this year’s EAU Annual Meeting to encourage some fun among congress attendees. We had dozens of enthusiastic entries which betrayed the social side of urology conferences today – see examples on our Awards Prezi. Most Social Paper (new category) – “Twitter response to the USPSTF recommendations against screening with PSA”. Published in BJUI 2015. Accepted by Stacy Loeb on behalf of Dan Makarov and other co-workers. Best BJUI Tube Video – “Extended PLND – creating the spaces”. Accepted by Declan Murphy on behalf of John Davis, MD Anderson, USA. Best Urology Conference for Social Media – #AUA15 – The American Urological Association Annual Meeting 2015. Accepted by Dr Stacy Loeb on behalf of the AUA. Best Urology Organisation – European Association of Urology. Accepted on behalf of EAU by European Urology Editor-in-Chief, Jim Catto. Since that time, over 1000 tweets have been sent using this hashtag, most featuring great pictures of our female urologists at work or at play. 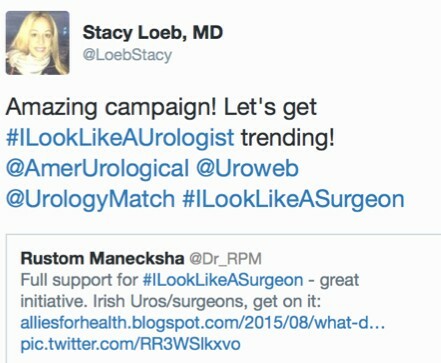 See plenty of examples on our Prezi or just search the hashtag #ilooklikeaurologist. A special thanks to our outstanding BJUI team at the Editorial Office in London, Scott Millar and Max Cobb, who manage our social media and website activity as well as the day-to-day running of our busy journal. See you all in Boston for #AUA17 where we will present the 5th BJUI Social Media Awards ceremony! Anybody who has attended a BJUI Social Media Awards ceremony will agree that these are a real meeting highlight. It is not only great entertainment with your excellent presentation of the awards Declan, but the chance to meet up with a fantastic likeminded group of urologists. Looking forward to the 5th BJUI Social Media Awards at #AUA17 in Boston.